Konstancja Kawalla, was born in Warsaw to well known musician family. Her mother Aleksandra was a concert pianist, her father Stanisław was a violinist, conductor, and professor at both “The Fryderyk Chopin University of Music in Warsaw”, and the “Music Department of Veracruz University in Jalapa” (Mexico). 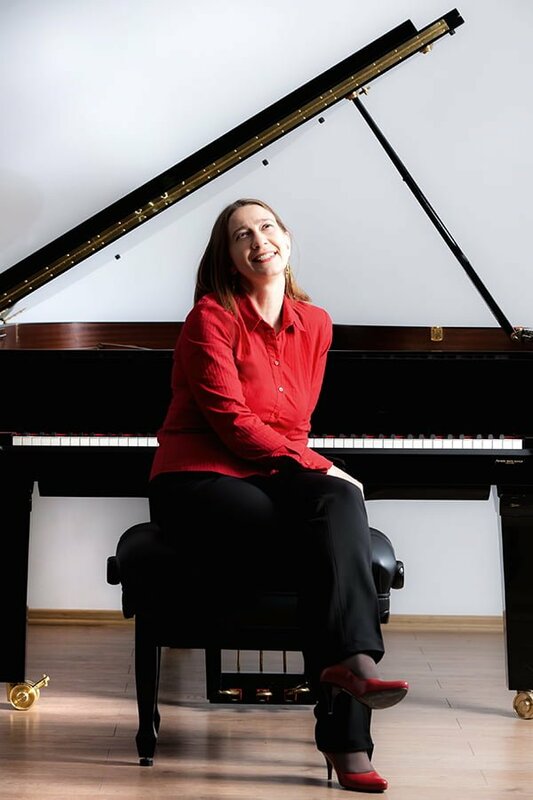 She began her piano studies at the age of 9 years at “The Karol Szymanowski Complex of State Music Schools No 4”, in Warsaw with pronounce professor Bronisława Kawalla. In 1981, Professor Kawalla, left Poland with her parents for Xalapa (the Capital of the State of Veracruz in Mexico), where she continued her studies with Oscar Tarrago, and later Alejandro Corona. In Mexico she took part in multiple piano master classes carried on by distinguished piano teachers such as: Piotr Paleczny, Nestor Castańeda Leon, Edith Picht-Axenfeld and Stanisław Heller. At that time Professor Kawalla recorded Witold Lutosławski’s “Bukoliki” and Aram Chaczaturian’s “Toccata” for Veracruz University Radio, and Mexican composer Mario Ruiz Armengola’s “Piano Sonata” for State of Veracruz TV. In 1986 she won the Second Prize in the “Xalapa Piano Competition” . A year later, she won the First Prize in the same competitions organized by the “El Sol Veracruzano” Gazette sponsoring and promoting young artists around all Mexico. During her stay in Mexico, she performed in multiple concerts in Veracruz’ State, Puebla, Morelia and in the capital of the country, Mexico City. She performed as a soloist with the “Xalapa Symphony Orchestra” and with the “Youth Orchestra of Veracruz” . She cooperated with conductors as: Jose Guadalupe Flores, Luis Samuel Saloma and Enrique Batiz. Her chamber music recitals include concert with an eminent Polish bassoon player Jerzy Lemiszka, with violinists Stanisław Kawalla and Agnieszka Maklakiewicz and cellist Anna Maklakiewicz. After returning to Poland, Professor Kawalla, undertook study at “The Fryderyk Chopin University of Music” in Warsaw with renowned professors Bronisława Kawalla, Alicja Paleta- Bugaj and Krystyna Wachowska. She performed in Poland in multiple concerts in Warsaw, in the Prince of Pomerania Castle in Szczecin, in the Polonia House in Pułtusk and Sieradz, as a soloist and with a violinist Joanna Kawalla. She performed also in concerts at “CERN”in Geneva, Swizerland, Vienna, Austria, and in Brno in Chech Republic. After finishing the studies in the Faculty of Instrumental Pedagogy” with the specialty in teaching piano, Professor Kawalla started working as a piano faculty and as an accompanist at the Private Music School of Bartłomiej Budzyński in Józefów. She also cooperated with the Chorus “Rubikon” conducted by a distinguished opera singer Anna Vranowa. She performed with the chorus in concerts in Poland and abroad, recorded an album and in 2004 performed Engelbert Humperdink’s “Hansel und Gretel” opera. She cooperated with Katarzyna Zachwatowicz – Jasieńska in the creation and recording of a children’s song-book. Presently Professor Kawalla is a piano teacher in the “Fundation”Music-Talent-Passion” at the “Karol Szymanowski Complex of State Music Schools No. 4” in Warsaw, “Zofia Zwolińska” Private Music School “Unisono”, and “Studio Arte”. Her pupil Piotr Walczak won The First Prize in the All-Poland Youth Music Competition in Warsaw in 2011 and 2012.